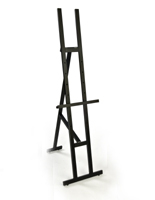 Looking for a decorative way to showcase frames or paintings? 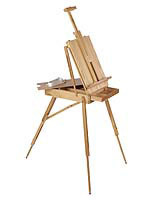 Wooden floor easels are the go-to choice for many reasons. 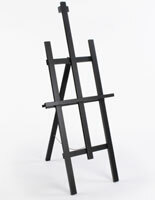 Their initial application comes from the art world, but that doesn't mean they have to stay cooped up inside the studio. 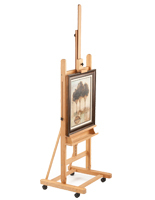 Thanks to their portable designs, wooden floor easels make excellent temporary displays. 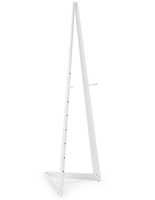 Set them up at wedding receptions or welcome visitors to a work seminar. 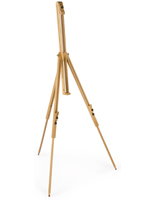 The advantage stems from the tripod itself. 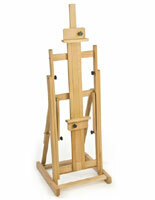 Buy a wooden floor easel for the occasion at hand, then reuse it for the next upcoming event again and again! 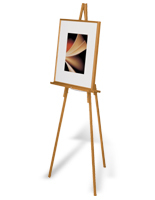 Display artist canvases, restaurant menus, or posters professionally and at a comfortable viewing level. 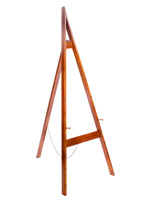 There is something about a wooden floor easel that elevates the caliber of any event, whether it's a gallery opening or a catered reception. 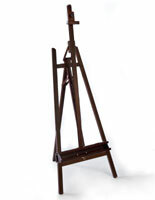 What are the two main types of wood display tripods? 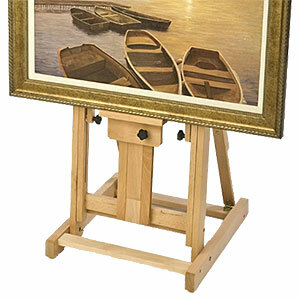 Floor easels for paintings need to have comprehensive adjustability. 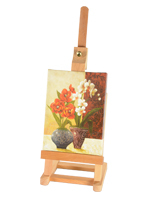 Canvases come in all sorts of sizes, so the support system needs to accommodate that. 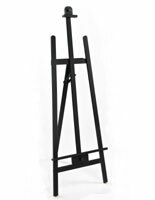 Important features include adjustable heights, front to rear tilt, top & bottom clamps, and optional casters for easy mobility. 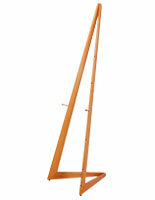 The stands are traditionally manufactured from beech wood and come with clear, natural finishes. 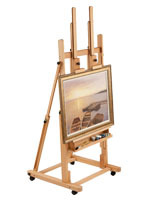 Floor easels for picture and poster frames can be more decorative with fewer bells and whistles. 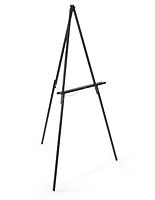 After all, you're just using the tripod to prop up a sign or portrait. 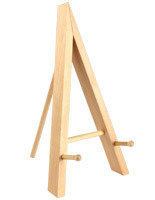 Further enhance the presentation with your choice of various wood finishes like black, cherry, or honey wheat. 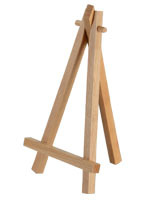 These models are fabricated from either beech or oak for durable and long-lasting performance. 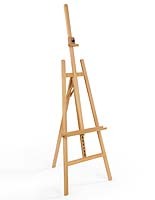 Since these easels don't require the full measure of features as on the art models, their designs can be streamlined. As a result, they do the same job but with less material. 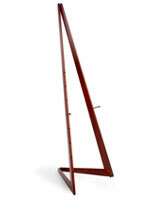 Also available are a small selection of woooden tabletop stands. 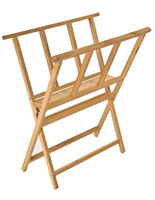 These make great merchandisers at the retail level. 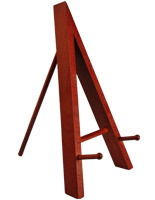 Use to display books, iPads, and more for customer perusal. 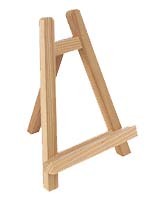 In addition to the many professional reasons for utilizing easels, don't discount the purely decorative applications. 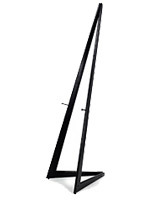 They make great conversation pieces in residential settings. 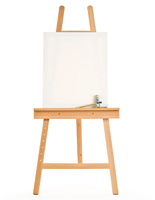 Showcase a favorite painting, photographic print, or a family portrait. 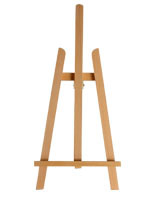 Since easels stand alone, their placement provides a dramatic focal point to any room. Displays2go stocks a huge assortment of tripods and display stands. Whether they're made of wood or metal, like fancy floor standing ornamental brass and wrought iron stands, they make attractive beacons wherever they are used. 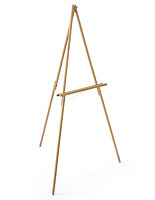 When it comes to an engaging, yet portable, sign or artwork display, nothing beats the elegance and sophistication only a traditional easel can afford.